We should be wrong to suppose the tattooing is peculiar to nations half-savage; we see it practised by civilized Europeans; from time immemorial, the sailors of the Mediterranean, the Catalans, French, Italians, and Maltese, have known this custom, and the means of drawing on their skin, indelible figures of crucifixes, Madonas [sic]. &c. or of writing on it their own name and that of their mistress. Tattooing appears to have always been present on Europeans—both travelers and non-travelers—although it waxed and waned in popularity, as all cultural practices do, and was utilized for shifting reasons and by varying types of groups (national, religious, occupational, etc.) at different times. Debunking the Cook myth has larger ramifications outside of the history of tattooing. It serves as a warning to scholars to appreciate how perceptions can become skewed when trying to universalize from a narrow research focus (texts only in one language, a focus on just one nationality, a limited date range for sources, etc.). Scholars who make broad claims bear responsibility to research widely and in multiple languages and to not take the general assertions of others for granted. Rather one must look at presented evidence in detail, evaluate whether counterexamples might exist, and then search for them. 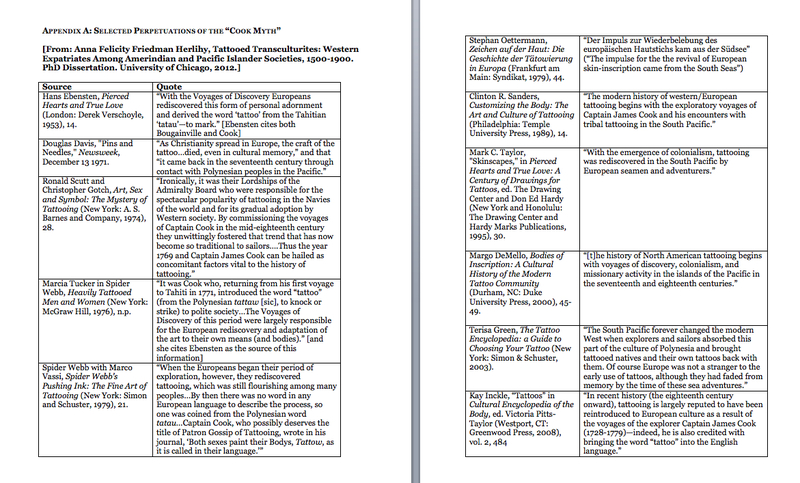 My own proposal for this dissertation (since substantially changed) started with the twin assumptions that the Cook voyage was originary to modern Western tattooing and that Western culture had primarily regarded tattooing as something negative. However, when I began to carefully read French and German sources that I had flagged as potentially relevant, it became clear (especially through the examples of piquage in pre-Cook North America—see Chapter 3) that the Cook-borne origin of modern tattooing needed to be properly interrogated and that historical attitudes about tattooing were wide-ranging. The Cook myth appears, at least in part, to have a linguistic origin leading scholars to presume Pacific origins and not look elsewhere for evidence; because of the Pacific, Cook-borne etymology of our modern word “tattoo,” many make the mistake in assuming something originary about this particular time and place. 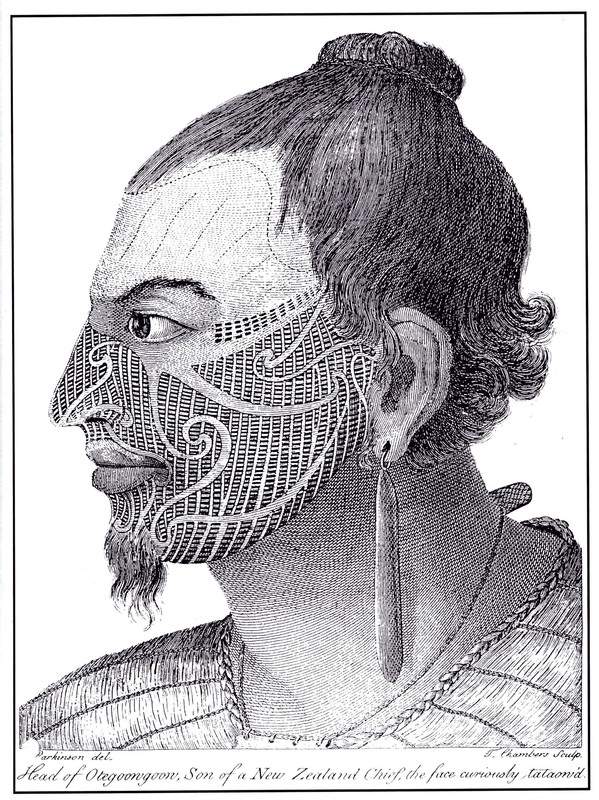 For example, the widely cited anthropologist Alfred Gell, relying upon faulty linguistic reasoning, asserts: “Tattooing, as it is now practiced in western countries, originated as a consequence of European expansion into the Pacific, as is witnessed by the Polynesian origins of the word ‘tattoo.’” Since no specific word for the operation of tattooing had been coined until the importation of the Tahitian tatau into Western languages (as nouns such as tattoo, tatouage, Tätowierung, tatuaggi, etc., and their related verbs), earlier authors used a variety of descriptive terms. Thus we read that individuals had their skin or bodies “pricked,” “marked”, “engraved,” “decorated,” “punctured,” “stained,” or, even, “embroidered.” These processes resulted in “black marks,” “pictures,” “paintings,” “engravings,” and “stains,” that were further described as “permanent” or “not able to be effaced.” Latin texts often referred to tattoos as stigmata. French texts used the verb piquer and the noun piquage (see Chapter 3). Through the use of these various descriptors and their equivalents in other languages, tattooing was recorded and noted pre-Cook on Europeans as well as those they encountered in numerous cultures around the world. Cook’s voyages and the subsequent dissemination of text and image about the tattoos observed and acquired abroad certainly mark a pivotal moment in the increasing visibility of tattoos on Europeans. But visibility does not necessarily equal presence—the burgeoning print culture that coincides with Cook’s and subsequent Pacific voyages just makes it seem like tattoos were mentioned and/or depicted more often. It is indeed possible that tattooing may have been a less common Western practice from late Antiquity through the end of the Early Modern period, but diligent scholars may be able to convincingly rule this out with careful archival research.My intensive search through American and British archives for overlooked or unnoticed manuscript primary sources for Western tattoos yielded far more material than could be utilized in this dissertation; both pre-Cook and post-Cook, transculturite and otherwise. Similarly, I discovered such a wealth of tattoo evidence in scouring published primary and secondary sources with respect to both the time period of this dissertation and earlier that I had to leave many leads unfollowed. What was included in this dissertation shows a significant precedence of practice and continuity with other markings on those of European heritage from centuries earlier. Regardless of whether tattooing increased on Europeans post-Cook, the acquisition of tattoos in Tahiti starting in 1769 was clearly not novel or any sort of discovery. A reliance upon the Cook myth flaws otherwise useful studies of the history of Western tattooing. For example, my main criticism of [Joanna]White’s otherwise excellent study of tattooed Pacific beachcombers [N.b. Joanna is a friend and I very much admire her work…a minor academic quibble here] resides in her assertion that: “What is beyond dispute, therefore, is that when voyagers to the Pacific encountered the elaborate, prolific and sophisticated motifs which characterised indigenous tattooing, covering various parts of the body, and in some cases (as in the Marquesan Islands), enveloping virtually the entire figure, these body marking practices were entirely novel to them.” Her analysis erroneously begins with sailors on Cook’s various voyages as the beginnings of “the tattoo as a badge of social identity, a mark which could be embraced by visitors who sought to cross cultural boundaries.” Had she linked the earlier, non-Pacific biographies and histories of those who acquired tattoos when resident in foreign places with those of the beachcombers, she could have analyzed this phenomenon as a type of social exchange not specific to any particular Pacific context. Similarly historical anthropologist Nicholas Thomas [N.b. I very much admire his work…just another small academic quibble! ], in his introduction to an anthology of incredibly detailed articles that analyze important primary sources for understanding the history of tattooing, ponders the question of the validity of the Cook myth, but ultimately comes down in support of Cook’s voyages as originary to modern Western tattooing citing the “striking” “near absence” of records of tattooing on sailors before 1769 and asserting “that Cook voyage encounters played a vital role, at a specific moment, in stimulating a tradition of maritime tattooing” that then becomes more broadly influential in the West. Thomas aggressively argues against American history scholar Ira Dye’s assertion that tattooing “was a common and well-established practice at the time of Cook’s voyages and probably long before,” a declaration that this dissertation supports. The fatal flaw in Thomas’s assumption may have been to only look at the type of long-haul sailors who spent most of their lives on ships, a group for whom bodily descriptions are scant before the increase in the types of surveillance-based recordkeeping (that also, perhaps not coincidentally) started around the time of Cook; a focus on English-language sources might also be attributable to his assertion of a paucity of mentions of tattoos on sailors (as Fleurieu noted in 1791, tattooed sailors were common pre-Cook in other European societies; as this dissertation shows, Englishmen pre-Cook did not seem to get non-Western tattoos as much as those of other national heritages—see Chapter 4). When we look at other types of travelers—especially those who sailed as a way of getting to non-island destinations where they then switched modes of transportation to continue their journeys—combined with the well-documented tradition of religious tattoos and yet-to-be-properly-researched history of secular identificatory and romantic tattoos, a continuity emerges to ascribe the roots of mariners getting tattooed in the Pacific to long preexisting European practice, not Polynesian novelty. That said, some tattooing carried out in the Pacific was indeed, as Thomas phrases it, “imported tatau”—the Pacific-motif tattooing discussed in Part II of this dissertation as markers of transculturalization. However, the mechanisms that allowed transculturites to get tatau and not souvenir “pricks” or “marks” are deeply embedded in the history of tattoo acquisition while traveling in the Americas and the Holy Land, and probably also from religious and secular traditions on European soil. The exact origin of the Cook myth is unclear. Dozens, if not hundreds, of texts perpetuate it. The earliest may be Hanns Ebensten’s short history of European tattoo, often cited by later popular works, which informs us: “there is no evidence of tattooing in Europe during the Dark and Middle Ages” and that “with the Voyages of Discovery Europeans rediscovered this form of personal adornment.” Hanns Ebensten, Pierced Hearts and True Love (London: Derek Verschoyle, 1953). See Appendix A for a selection of some of these perpetuations. A ubiquitous (and thus especially egregious) version can be found on Wikipedia, which even employs a subheading “Reintroduction in the Western World”: http://en.wikipedia.org/wiki/History_of_tattooing# Reintroduction_in_the_Western_world (accessed April 21, 2012). Although the myth can be found in English- and German-language texts, French-texts tend to appreciate a much broader history of European tattoo, perhaps because of the familiarity with piquage in seventeenth and eighteenth century North America (see Chapter 3) For example, numerous examples of tattoos consistently applied from the ancient period through the modern period can be found in both of Caruchet’s books: William Caruchet, Le tatouage ou le corps sans honte (Paris: Séguier, 1995); William Caruchet, Tatouages et tatoués (Paris: Tchou, 1976). A recent popular French text on sailor tattoos also exposes the fallacy of an attribution of the origins of modern tattooing to Cook’s voyages, even titling the first chapter “Naissance d’un mythe” (“Birth of a Myth”): Jerome Pierrat and Eric Guillon, Les gars de la marine: Le tatouage de marin (Clichy: Editions Lariviere, 2004). Caplan’s important and groundbreaking anthology about the history of European tattoo begins the work of trying to recover the pre-Cook history, but leaves off, positing a “discontinuous” history of European tattooing that breaks somewhere in late Antiquity and doesn’t reemerge until the Early Modern period. As more and more recent evidence of tattooing in the medieval period emerges, as well as in late Antiquity and the Early Modern period, this discontinuous history hypothesis becomes as flawed as the Cook myth. Caplan, Written on the Body. Other factors with respect to this myth perpetuation appear to be related to the aforementioned flawed assumption that because tattoos do not seem to have been a majority practice in Western culture there is something wrong with them, the legacy of the aforementioned “us versus them” characterization of contact between Westerners and non-Westerners, and the rise of scientific racism described in the Conclusion. People are always reluctant to associate “taboo” practices with their ancestors, preferring to sanitize history with absence. Stories of disappearance and reappearance are also considerably more psychologically and emotionally compelling than those of continued presence. Alfred Gell, Wrapping in Images: Tattooing in Polynesia (Oxford: Clarendon Press, 1993), 10. Many other examples exist. For example, the publisher’s blurb for one recent major academic publication on tattoos, (Nicholas Thomas, et al., eds., Tattoo), promotes this myth in its second sentence: “Citing the Polynesian derivation of the word “tattoo,” many scholars and tattoo enthusiasts have believed that the modern practice of tattooing originated in the Pacific, and specifically in the contacts between Captain Cook’s seamen and the Tahitians.” See: http://www.dukeupress.edu/Catalog/ ViewProduct.php?productid=13788 (accessed 1/15/12). For a useful overview of the German and Italian terms used to describe tattooing pre-Cook, see Valentin Groebner, Who Are You? : Identification, Deception, and Surveillance in Early Modern Europe (New York: Zone Books, 2007), 107. Note also that I mainly limited my search in manuscript archives to the language I know best (English) and worked only with original manuscripts from circa 1700 on (although I consulted some earlier manuscripts through published versions or excerpts in secondary sources). With respect to published materials, I tended to mainly work with English and French (the language I know second-best) sources giving a more cursory survey to texts in other languages with which I have some familiarity (German, Spanish). I discovered many things in other languages through translation (and even consulted a few of the originals getting assistance with translations). The untapped potential of both manuscript collections and published sources in German, Dutch, Spanish, Italian, Russian, and Portuguese, in particular, is astounding, especially when medieval material is considered. Nicholas Thomas, “Introduction,” in Tattoo: Bodies, Art, and Exchange in the Pacific and the West, ed. Nicholas Thomas, Anna Cole, and Bronwen Douglas (Durham: Duke University Press, 2005), 13, 21. Ibid., 13; Ira Dye, “The Tattoos of Early American Seafarers, 1796-1818,” Proceedings of the American Philosophical Society 133, no. 4 (1989): 523. Also my colleague Matt Lodder (who has done a lot of his own myth debunking) featured some of my research on this topic in a 2012 issue of Total Tattoo a while back (you can order the back issue #94 here or digitally here).